In previous columns, we've briefly touched upon creatures of the vermin type. Tiny Creatures gave a few suggestions for small vermin, as well as for swarms, and Aquatic Animals covered crabs, clams, and jellyfish. This week, we're going to take a longer look at building insects, arachnids, and related creatures. As I mentioned in the Tiny Creatures installment, a few options exist for small insects using existing parts, as shown below. 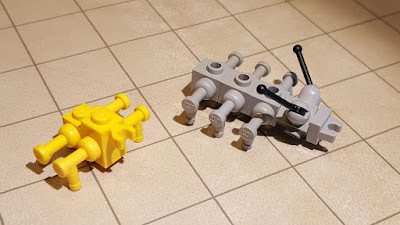 When building insects, SNOT bricks are invaluable for attaching legs to a brick body. The photo below shows two very basic insect models, using faucet pieces as legs. 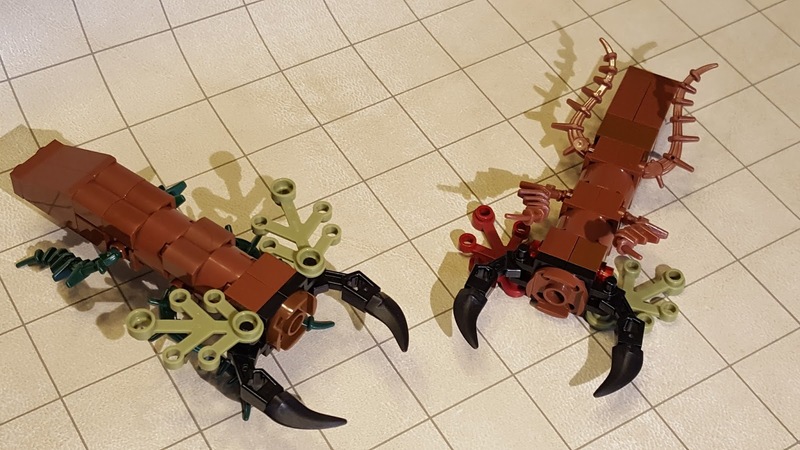 Note how "travis bricks" (1x1 bricks with studs on all four sides) are used for both the body and the head of the gray bug. For larger bugs, plates with multiple bar attachments are useful for attaching multiple legs that can be posed. 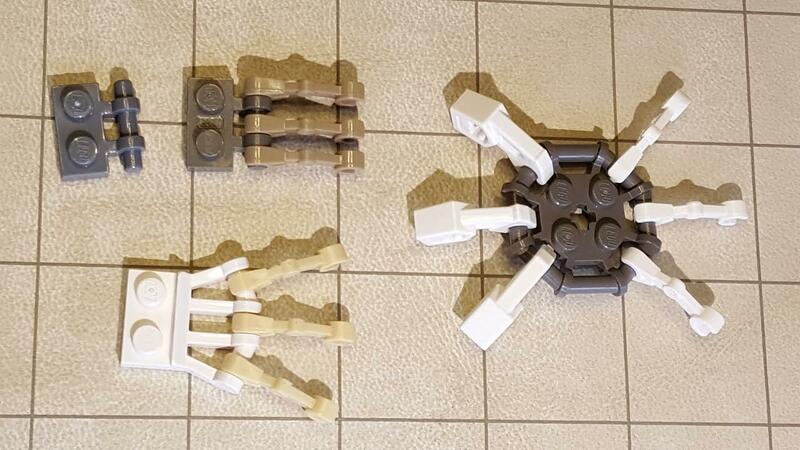 The photo below shows some examples, using droid/skeleton arms and "bad robot" arms (as the thicker parts on the left side of the octagonal plate are known). 1xN plates with clips can be used to attach longer legs, as well as heads and tails. To build additional body parts on top of the octagonal plate, start with a 2x2 round plate to give you enough clearance above the bars and legs. 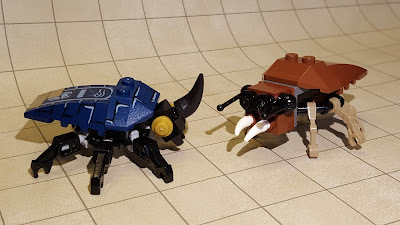 The blue and black scarab below, from the Pharaoh's Quest theme (Scarab Attack), is an excellent model for a Large or Huge beetle. It uses the octagonal plate shown above to attach the legs and head. 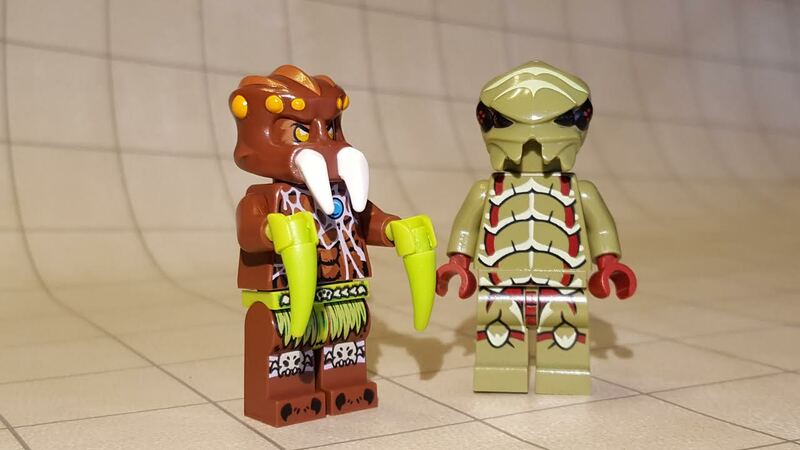 I modeled the brown ankheg beside it after that general body plan, changing the style of the head and legs. The next photo shows the deadfall beetle, a new monster of my own creation, that uses camouflage to ambush its prey. This bug is long and tree-like, almost like a walking stick, but the large mandibles would also be suitable for a stag beetle. Deadfall beetle, upright (L) and showing the underside (R). Bees and wasps have similar body types which can be suggested by just a few bricks. The two models below both use a travis brick as the starting point. 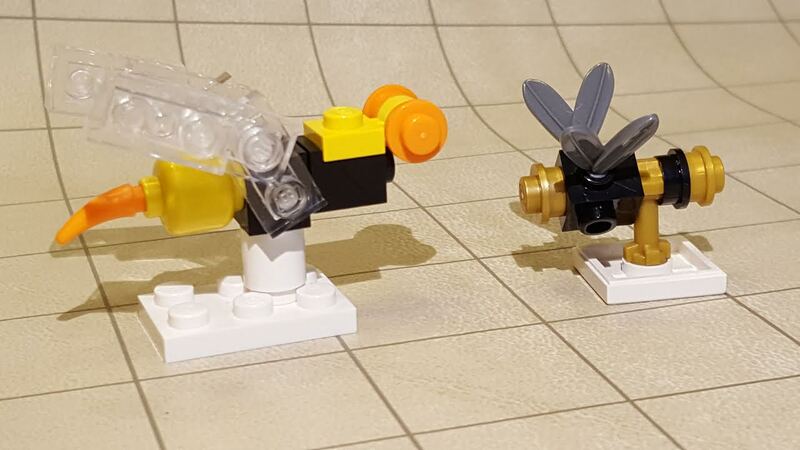 The bee uses feather plumes for wings, and a weapon handle to attach a tile base. The larger wasp uses stepped clear 1x2 plates for wings, a blank minifigure head for the bulbous abdomen, and a headlight brick to attach a head made of small plates. The easiest way to build a centipede is to add more segments to the six-legged insect from "Basic Bugs," above, until the needed size is reached. 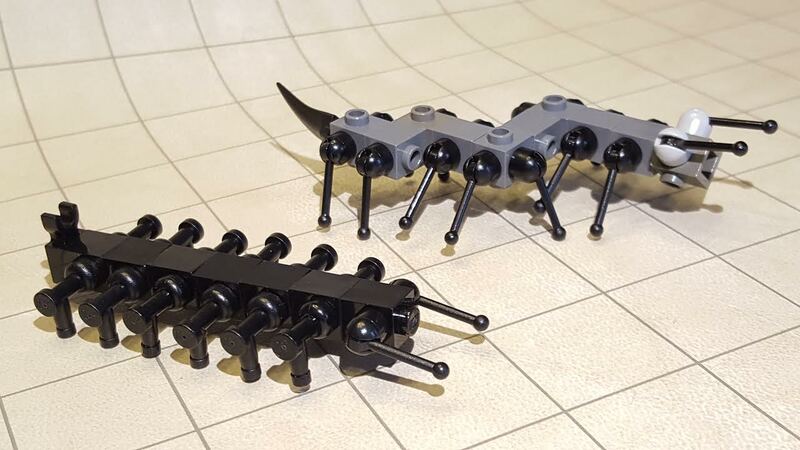 The black centipede shown below uses 1x1 bricks with studs on only two sides, for a smoother body shape. 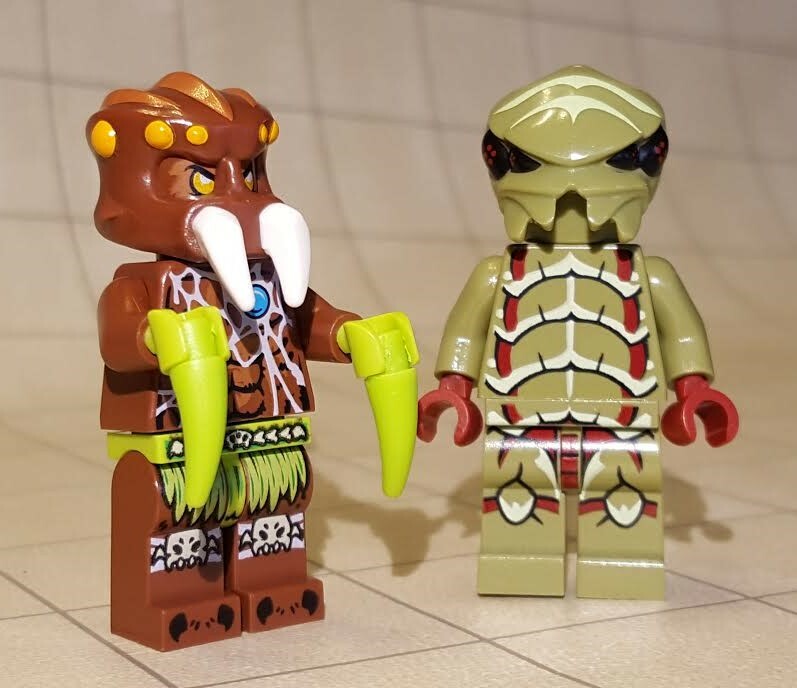 However, simply repeating segments will quickly produce a model that is far too long and skinny to conveniently fit onto a battle grid where all creatures take up square spaces. A longer body can be built in the same space by using travis bricks to add 90-degree bends to the body. I did this for the gray centipede below, and also used levers to provide longer, slimmer legs. 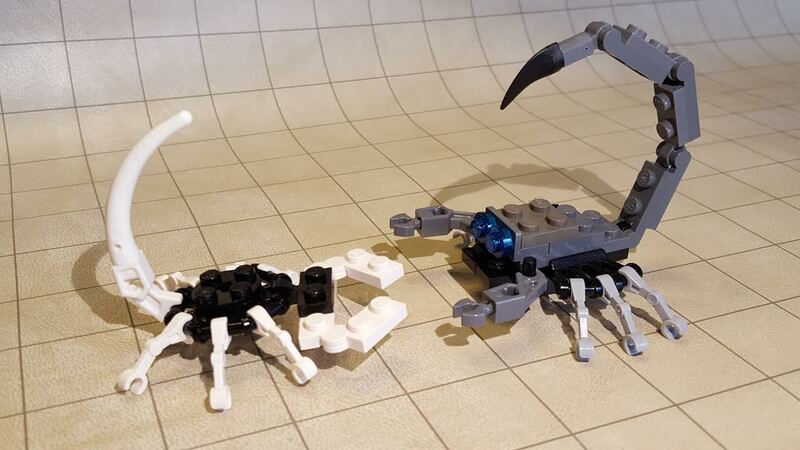 Larger scorpions will need leg assemblies like those described under "Basic Bugs." The black and white scorpion below uses an octagonal plate to attach legs, a tail, and the head/pincers segment. The gray scorpion uses two of the tapered three-bar plates to attach the legs, and other hinges to attach the pincers and tail. 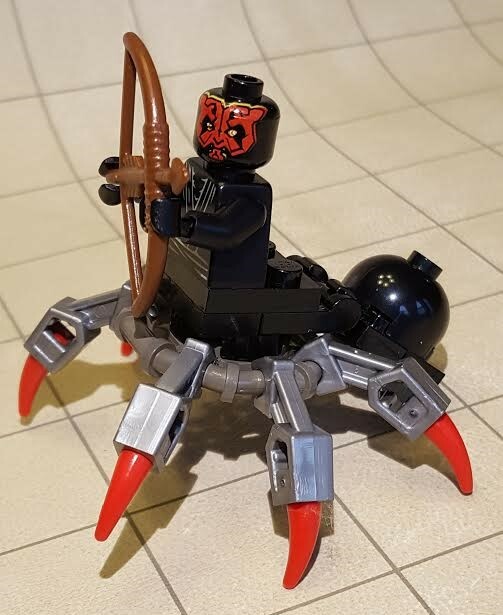 The basic LEGO spider is almost always in production, so is easy to acquire. 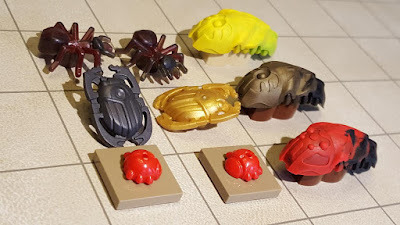 The old Harry Potter set Aragog in the Dark Forest included 1x1 and 2x2 tiles printed with spiders, which are perfect for Tiny spiders and as swarm counters, respectively. That set also included the largest spider model produced up to that date. For larger spiders, the leg assembles described under "Basic Bugs" are a useful starting point, but are not the only option. 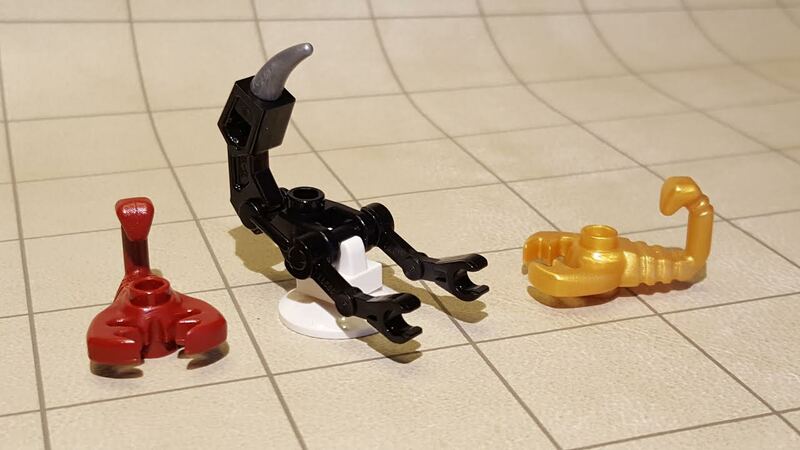 The black spider above is from the Monster 4 LEGO Game, but is made entirely of easy-to-find parts, including short legs bad from "bad robot" hands. The light gray spider uses droid arms, but is a little top-heavy, so includes a clear brick to support and balance the body. 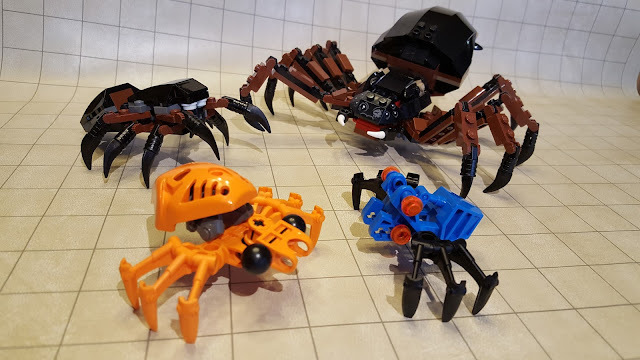 The gray-and-brown spider is an even simpler build using one of the relatively new tree branch plates, inverted to turn its hooks into legs. The largest spider model produced so far by the LEGO Group is, of course, Shelob (from Shelob Attacks), who would be a Colossal miniature. 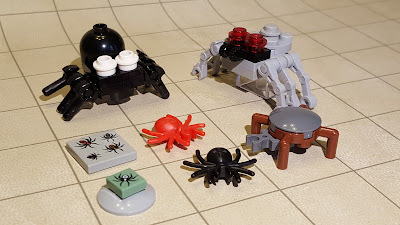 A smaller (Large to Huge) version of Shelob, using the octagonal barred plate as a base, appeared in the Lord of the Rings Gollum Fun Pack for LEGO Dimensions. A number of Pathfinder monsters are very similar to vermin in appearance, so I will mention just a few of them here. Ankhegs have already been mentioned under "Beetles," above. Araneas, bebeliths, phase spiders, and retrievers are all arachnoid in form, so simply need appropriately-sized spider miniatures. Driders have the lower bodies of spiders and the upper bodies of drow. The spider body is easily made using the octagonal plate shown in "Basic Bugs." Add a 2x2 round plate to the top, then a suitable minfigure torso and head. Additional plates to make a longer abdomen are optional. The Legend of Chima theme has some Spider and Scorpion Tribe characters that would make excellent fully-arachnoid driders, but mine (shown here) uses a Darth Maul minifigure. These are so inspiring!!! Thank you!! !